Available year round, but best in the summer & fall. We are unable to ship live mussels to Hawaii. Mediterranean mussels are beloved in Europe (especially Belgium and France) for their sweet flavor, attractive wide shells and juicy, tender flesh. These mussels are shipped live and fresh with their beards still attached. Farmed mussels are regarded as a very sustainable seafood choice. Because these mussels are farmed suspended in nets above the ocean floor, they have a cleaner flavor and remarkably pristine shells that require little or no scrubbing before use. They are the smallest, most tender size grade (22-34 pieces per lb). Besides being tender, juicy & tasty, mussels are also quite healthy. They are low fat and a great source of protein as well as other nutrients like vitamins C & B12, iron, potassium, zinc, etc. For best shelf life, do not de-beard these mussels until just before you cook them. Store live Mediterranean mussels in a bowl in your refrigerator covered with a damp towel. Open Mussels: If your mussels arrive with several of their shells open (or you find many of them are open when you get ready to cook them), do not despair. Contrary to popular belief, they may not be dead, just thirsty. Up to three days fresh. Three months if meat is frozen, then two days once thawed. These Mediterranean mussels arrive live with the “beards” still on so they will stay fresh longer. Just prior to cooking the mussels these beards should be pulled off. Do not do this very far in advance. Most recipes call for scrubbing mussels with a wire brush before cooking, but net farmed mussels are often so clean that instead only a quick rinse is necessary. 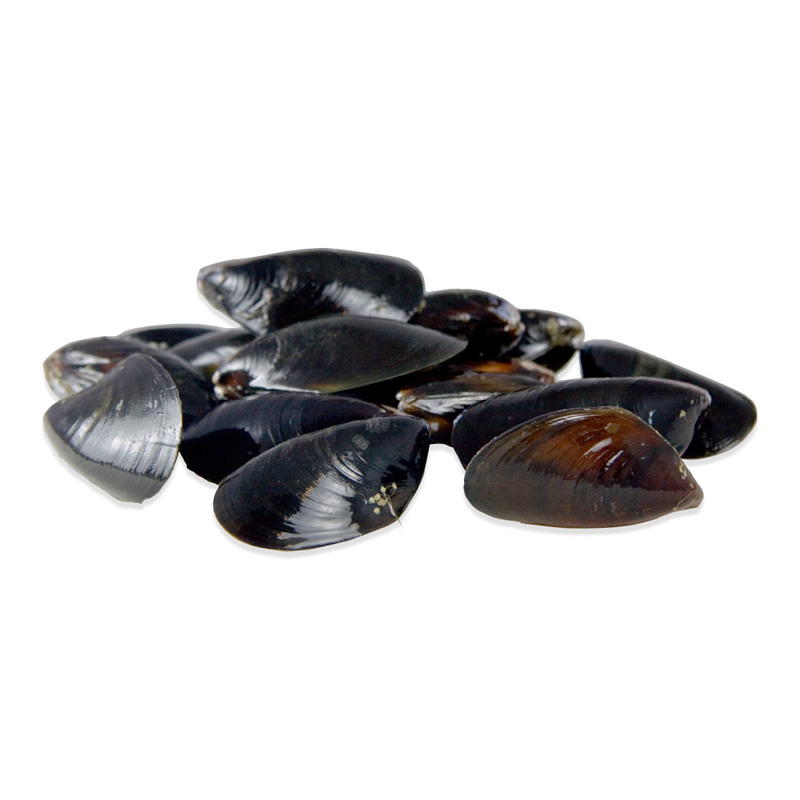 Mussel meat can be breaded & deep fried, broiled, sautéed, baked, braised, stir-fried or smoked. 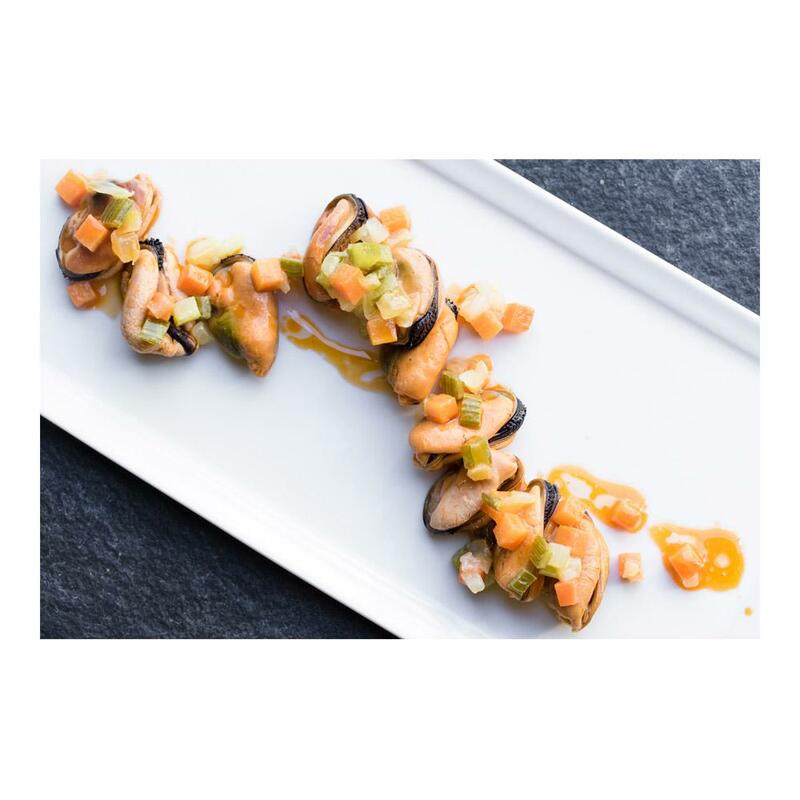 Because of the quality of their meat, Mediterranean mussels stand up to multi-stage cooking particularly well and can even be steamed open, then have their meat marinated, seared and then braised…all without becoming tough! Mediterranean mussels’ wide shells make them an excellent choice for mussels baked or broiled on the half-shell, as there’s extra room around the meat for bread crumbs, herbs and other toppings. Mussels pair superbly well with white wine, garlic, tomatoes and herbs. A common side dish with mussels in Europe is French fries (perhaps with a spicy aioli). It doesn’t happen often, but Mediterranean mussels can actually get glued shut while cooking (this is particularly likely to happen when they’re submerged in liquids) due to a substance on their shells that resists barnacle growth. Best mussels money can buy! I get lucky when I get the big ones . I stuffed them with rice . Been buying it 5-6 years now . We love it !